I’m trying to picture what a geranium smells like, and I’m coming up blank. My scent bank is empty when it comes to geraniums. I do, however, know what a geranium smells like when mixed with orange essential oils, because that’s the scent of ecostore’s new laundry powder, aptly named Geranium & Orange Laundry Powder. ecostore sent me a box of their new Geranium & Orange Laundry Powder to review for Kiwi Mummy Blogs. I didn’t know what they were sending me before it arrived, so had to laugh when I opened the box and found the exact same laundry powder I’ve already got sitting on my laundry shelf. 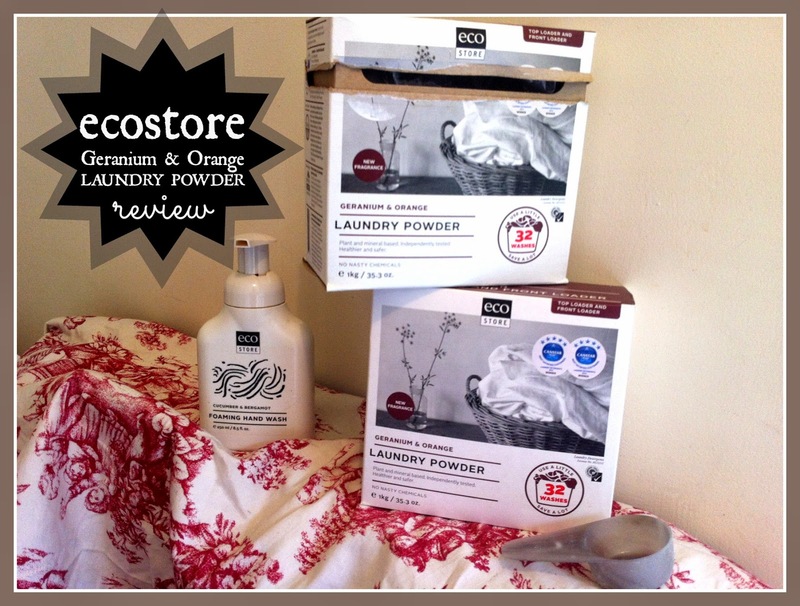 Oh yes ecostore, I have discovered your new laundry powder and am quite the fan. In fact, I’m a fan of all your products, especially after reading ecoman and realising what a clean, green and ethical company you are. Anyway, back to the Geranium & Orange Laundry Powder. I love its smell. I take a deep breath every time I pour a scoop into the washing machine, and feel like I’m getting my aromatherapy hit for the day. ecostore worked with a French perfumer to create the new fragrance, which is an essential oil blend that has an uplifting, summery feel. Normally I would be a little fearful of breathing in cleaning chemicals, but I don’t worry about that with ecostore products because they don’t contain anything nasty. All ecostore laundry products are plant and mineral based, while being free of water pollutants like phosphates, and the skin-irritating chemicals you’ll often find in other laundry products like enzymes, optical brighteners, synthetic dyes and perfumes. I feel really good about using ecostore’s Geranium & Orange Laundry Powder to wash my children’s clothes. It does an excellent cleaning job too, even on my seven-month-old’s cloth nappies. I’d say it’s as good, if not better than any other laundry powder I’ve used. It’s lovely because it leaves our clothes with that refreshing hint of geranium and orange fragrance, without being overpowering. Since the laundry powder is super concentrated, a 1KG box lasts a long time in our home. Using full scoops, it’s designed to last 32 washes, but I use a little less than a scoop each time, so I stretch a 1KG box to 40 or more washes. Give it a whirl in your washing machine and let me know what you think.